Music and arts companies are working on proposals for a spectacular Symphony of Metal, Fire and Water to celebrate Rotherham's industrial past. The Eye Music Trust was a key part of an event last year at Albert Dock Liverpool which celebrated steam trains, engines, lorries and boats. 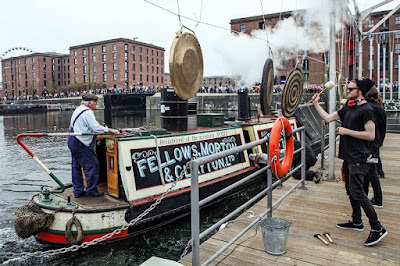 Its Liverpool Symphony of Steam, Sparks and Space was a live performance described as a "serene ballet for steam boats leading to pounding drums of Katumba, flaming oil drums, clanging metal instruments and acoustic pyrotechnics." The Trust is now working in partnership with Rotherham's Open Minds Theatre Company (OMTC) to bring something similar to the River Don. OMTC is an arts organisation delivering workshops, performance and arts projects across a wide variety of art forms. The Eye Music Trust delivered its Colourscape Festival in Rotherham last September. The Symphony of Metal, Fire and Water to celebrate Rotherham's industrial past is set to be staged on the river Don by the Keppel Wharf building in Rotherham town centre, complete with floating rafts, giant metal percussion (including spectacular Giant Tubular Bells), pyrotechnics and Samba. Open Minds will also plan to include a giant "Flame Organ", in the early evening to gain maximum benefit of fire and pyrotechnics. The Liverpool event featured the creation of the World's Largest Set of Tubular Bells (soon to be given official status by Guinness Book of Records) which will eventually be installed in Magna Science Adventure Centre in Rotherham for the public to play and enjoy. Open Minds are presently seeking sponsorship and support for the Rotherham event. This support can be in-kind (providing rafts, scaffolding, pyros etc) or financial (with return of publicity for any sponsorship and a hospitality package on the night).